Governor General Bob Dade received his first official guest at Government House on Tuesday with the Prime Minister of Solomon Islands Manasseh Sogovare. Sogovare and his delegation arrived in Port Moresby on Monday. The Governor-General and Sogovare discussed several issues including the Melanesian Spearhead Group meeting, peace and security in the region, Pacific Agreement on Closer Economic Relations (PACER plus), education and trade relations between PNG and Solomon Islands. Sogovare said, Solomon Islands is grateful to PNG for its support during the island country’s 1999 ethnic conflict that resulted in a four month nationwide state of emergency and the formation of RAMSI of which PNG played a prominent role in restoring stability and security in Solomon Islands. “We must protect peace and stability in the region. We are fortunate to live in a region where despite certain challenges we do not experience large scale conflicts as experienced in other parts of the world. Our challenge now is to maintain peace and stability in the region. 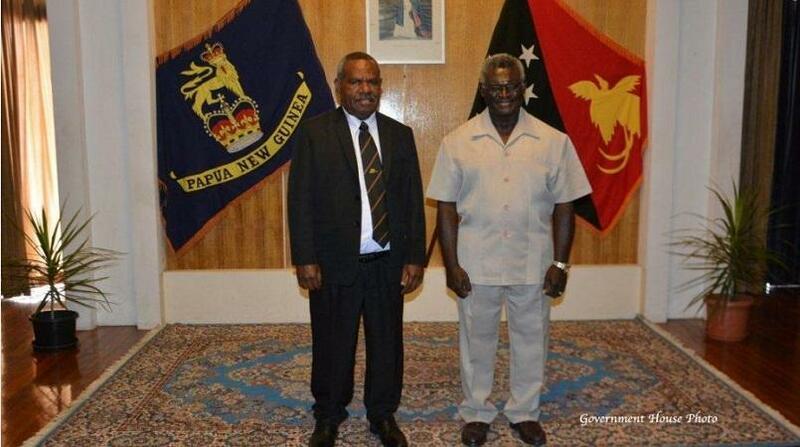 We thank PNG for the role you played in restoring peace in Solomon Islands,” the Prime Minister said. He said, Solomon Islands appreciates the close collaboration PNG and Solomon Islands share in areas of trade and investment and in particular investments by PNG-owned companies which are contributing to employment opportunities and economic growth in the island country. He said, Solomon Islands and Fiji have signed the PACER plus agreement and encourages PNG and Vanuatu to do the same. The Prime Minister also expressed his gratitude to the PNG Government for providing funding assistance to Solomon Island students to pursue tertiary education in universities in PNG. “A lot of these students go back to Solomon Islands and contribute their knowledge to guide the national policies of our country. Education must be focused on modern ideals and way of life appropriate for our time … I thank the PNG government for assisting our students in this area,” the Prime Minister said. Governor-General Bob Dadae said, Prime Minister Sogovare’s visit reflects the close relationship our two countries share and must be maintained. The Solomon Island Prime Minister is visiting PNG in his capacity as Chair of the Melanesian Spearhead Group. PNG will assume the Chair of the MSG later in the year.